I have lived in San Diego a long time. Except for a few months when my husband and I lived in Chula Vista while looking for a permanent place, over 45 of those years have been in the Pt. Loma/Ocean Beach area. I have watched restaurants come and go; some quickly; some stay for a while. “Seaside Pho & Grill” has located in a spot that has had two other restaurants there over the years. The first restaurant that I was aware of was “La Playa.” It was one of the first reviews I ever did and that was in 2010. Unfortunately it closed a year or so later. The next restaurant to open in that spot was “Gabardine” in 2012, and it closed its doors in 2014. Both restaurants had wonderful food and Brian Malarkey is an experienced restaurateur. Yet, it was not successful. Now comes “Seaside Pho & Grill.” It is owned by a married couple – Thuy Nguyen and Waco Williams. The majority of recipes on the menu are family recipes from Thuy. (She was not there when my Japanese student Hitomi and I ate there recently, but Waco was and we had a delightful time talking to him after our meal.) 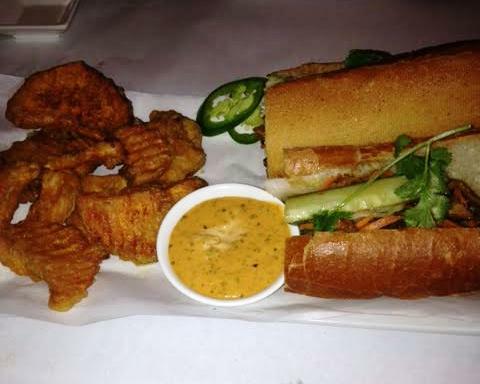 Waco told us that the “Garlic Butter Wings” was an original recipe from Thuy’s grandfather! In addition to Thuy and Waco, their nephew Josh is the Maitre De and greeted us at the door. What really blew us away at the end of the evening was when Waco took us into the “banquet” room to show us the murals that Josh had painted on the walls. (If for no other reason one should take a gander at the excellent exhibit this young man has created.) Our waiter was Ryan, and there were several other people working the tables that we did not meet. The “runner” – a young lady that delivered the food to the tables was sweet, concerned, and very pleasant. There are two soups, both offered in small or large portions ($6.75/$8.75.) There are also two salads – a chicken salad for $10.95 and a small ($6.75) or large ($9.75) Seaside salad. Beef, Chicken or Shrimp can be added for a small fee. There is the traditional Pho – starting at $9.95 for the Rare Steak, All Natural Chicken Breast Organic Tofu and/or Vegetable and the highest price is a “Rare Filet Mignon” for $12.95. There are Rice/Noodle Bowls; Desserts, an extensive Beer/Wine menu, as well as having a full bar. 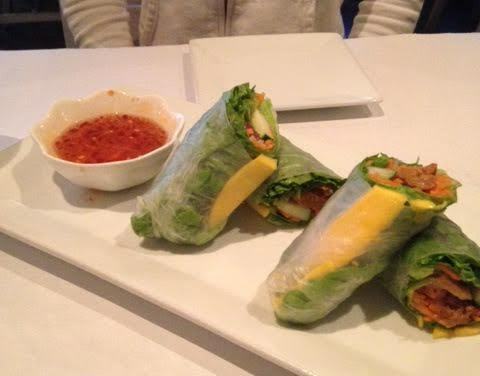 We started out with an order of “Seaside Rolls” ($7.75) that were made with Pork and Mango. It was an excellent combination and very succulent. They also had fresh lettuce, cucumber, and herbs with a spicy dipping sauce. 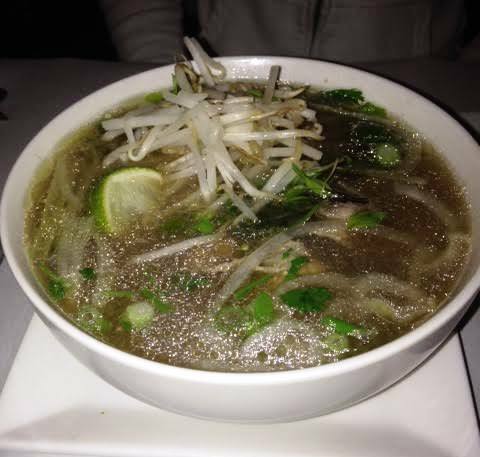 Hitomi had never had Pho before, and she ordered the Rare Steak Pho. It was made from a beef/chicken bone broth, and had rice noodles, and was served with fresh bean sprouts, basil, lime and jalapeno chilies. The flavor was excellent. I wanted to try something I had never had before so I ordered the “Banh Mi” – a Vietnamese sandwich of sorts. It was made in a fresh baguette stuffed with, in this case, Sesame Pork ($11.75) red pepper, aloli, pickled carrot, Daikon cucumber, cilantro and jalapeno slices. It was served with beer battered sweet potato fries, and I took half of it home. The hot, tasty fries were similar to tempura, but also different. I picked out the jalapeno and put them aside, but the rest of the sandwich was fantastic. We found the service to be excellent; Ryan asked us throughout the meal how everything was and if we needed any additional items. Josh was always there and when he noticed my glass needed refilling with water he gently suggested it to Ryan. Our wait between courses was just right; the noise level not to high, even though there was a party of four sitting right next to us. So what didn’t we like? This is such a minor thing it is hardly worth mentioning, but it is so comical that I can’t resist. Hitomni is a 25+ airline attendant here from Japan to improve her English so she can begin flying on international flights instead of just domestic. She has been using chopsticks since she was two years old. Yet, there was something about the chopsticks at this restaurant that she could not master. They were much longer than the Japanese chopstick; they were very shiny and thick. Then ends were square; not pointed, and I took a picture of her using a spoon with her chopsticks because she could not use just the sticks. I mentioned it to Waco, because it was so odd and he mentioned that they had thought of changing them out also for the same reason. He said they were the traditional Viet Nam chop sticks, but he also had had trouble using them in the past. Is it a deal breaker? Of course not, but until they are changed, don’t be surprised if you have difficulty getting the food to your mouth. Will we go back? Definitely. It was truly an enjoyable meal. Funny thing about that style of chopstick- I have been using them since I was a little kid in Hawaii. Yes- they do handle different. I actually prefer them, but it’s only due to familiarity. A Banh Mi for $11.75?!?! Ok, they came with fries…but wow! I’ve had plenty of Banh Mi sandos…mostly NOT in this area. Usually in Kearny Mesa and City Heights. They are usually NEVER above $3.95. They are known for being a very inexpensive sando. Even if the fries were $3.95 it wouldn’t add up to over $11! My fave place to get a BBQ Pork Banh Mi is Paris Bakery on El Cajon Blvd in City Heights. But I do like the fact that they have a sm and a lge Pho. I can never finish a big one. Can’t wait to try their butter garlic wings. 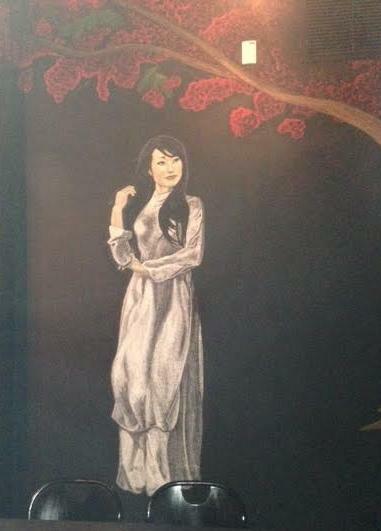 My favorite ones and actually my latest restau I love in Kearny Mesa is Phuong Trang. Their food is so good and I’m in love with those wings, so it will be fun to try. Mercy it was unlike any I have had before. I ate off of it for 3 days. Wow. Ok, maybe it was a humongous one then! This place made the mistake of pricing their food too high. The pho which is $6.95 at most other for places, is $11 here. I’m sure a lot of locals and college students would love coming to this place if their prices were more reasonable. I’m not sure if it’s already too late to change the pricing, but this place is frequently empty when I drive by.